Explore impressive scenery, discover birds and wildlife, marvel at traditional fishing boats, meet friendly communities and find tranquillity on the safe, clean water. 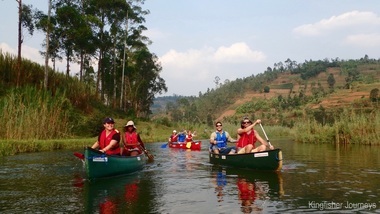 A fun, half-day adventure on the water in modern canoes close to Musanze! NEW: Spectacular kayaking adventures are now operating between all three resorts: Gisenyi, Kibuye and now Cyangugu! Camping on uninhabited islands, staying in local guesthouses and optionally visiting one or two top hotels, we explore the entire Rwandan coastline of Lake Kivu! * Based on 4 clients. Price includes all lunches and meals whilst camping, tents, sleeping bags and campsite equipment but excludes meals and accommodation at guesthouses and hotels that you will need to pay locally. Yes - you can do this! And there are no hippos or crocs here! There are generous discounts for guests staying at partner hotels in Rwanda, charities, NGOs and other volunteers as well as Rwandan and East African Community citizens and residents. Paddling along the lush northern coastline between Gisenyi and Kibuye, we dip into inlets and cross bays to soak up the spectacular scenery, peace and tranquility. Classic Lake Kivu fishing boats ply the waters at sunset, their crews singing rhythmically as a traditional way of life flourishes along the verdant shore. Numerous birds dart in and out of bushes and the active Nyiragongo Volcano can be seen rising above the surrounding hills. Near to Gisenyi, we visit coffee islands where you can watch (and experience) the entire coffee making process - from bush to cup. And in Lake Kivu's 'Bay of Islands', near to Kibuye, we explore many uninhabited islands and watch roosting bats, vervet monkeys and keep a look out for Congo clawless otters. 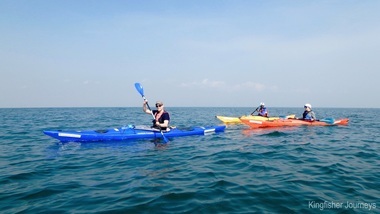 With its crystal clear, incredibly blue and very clean water, Lake Kivu is safe for kayaking. There are no hippos or crocodiles, the weather is calm most of the time we're on the water because we're careful to avoid times when the wind is too strong or the lake is more than a little choppy. Our kayaks are also very stable, easy to paddle and specifically designed for touring along the coastline. We provide all the high-quality equipment and instruction you'll need so you'll find that kayaking on Lake Kivu is the most rewarding way to explore, discover and journey through the best of Rwanda. Young people are very welcome! You can book for yourself if you're over 16 whilst we also take young people from 12 years kayaking when accompanied by a responsible adult. Please Note: Whilst no experience is needed, you will need to be reasonably fit and mobile. ​A fun half-day adventure in the lush countryside, on a gentle river near to the gorillas! We'll meet in Musanze take you to the river and bring you back afterwards. Young people are very welcome! You can book for yourself if you're over 16 whilst we also take young people from 10 years when accompanied by a responsible adult. 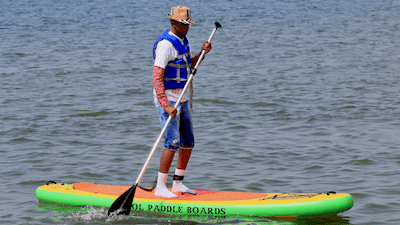 Bring your family and friends to Gisenyi and go Stand Up Paddleboarding on Lake Kivu! It's easy and lots of fun and a great activity for children from 4 years old. Based at Serena Lake Kivu Hotel. Please note that Kingfisher Journeys does not organise transport around Rwanda, hotel accommodation or any other activities. Kingfisher Journeys is proud to have created something very special in a part of Africa where there is still too much poverty - it's our mission to create opportunity and improve lives. 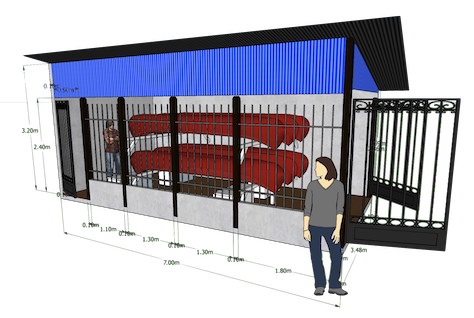 However, right now we urgently need a secure place to store our kayaks and canoes - leaving them outside the kitchen of a friendly hotel is no longer an option! 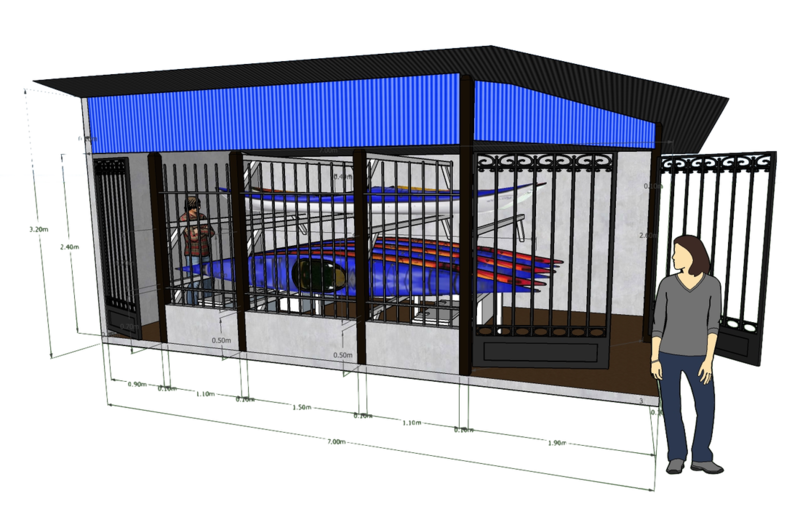 So please help us build the storage facilities where we can keep our kayaks and canoes. Then we'll be able to continue to train and employ new guides, create opportunities for rural people and make a difference in the communities where we operate.